Just for fun, I came up with a list of characteristics that might apply to you as a writer. Some are serious, some are humorous. Enjoy! You have more pens, pencils, notebooks and sticky notes than an office supply store. You email a writer friend about a character in your novel and your friend’s husband thinks something’s wrong with a real person. You trip over piles of books on the floor during the night. Dear me there are so many good writing books, how can you choose one to write a review about? Well, I can’t. 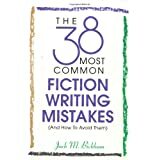 38 Common Mistakes is one of my favorites. It is helpful, truly helpful. I have referred back to it often. It is one of those that you really should have on your shelf. It says it is only 38, but it feels like much more. Your bookshelf should have a spot for this book. 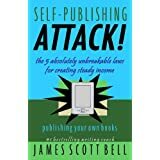 Self Publishing Attack by James Scott Bell is a wonderful work for those of us interested in self publishing. I have published my novel, Caitlin’s Summer Adventure. It is available both on Kindle and in paperback. And I have Mr. Bell to thank for assistance in my journey. This book is easily one of the most helpful books I have read on self publishing. The points are clearly explained and it has a positive energy that keeps you reading and re-energizes you for your project. 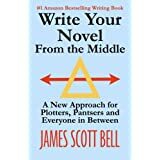 The title of this book is intriguing enough to plant a question in the mind of a writer to pick up and read the book to discover how anyone, be it even a seasoned writer such as James Scott Bell, could accomplish a task working from the middle back, and to the beginning forward while writing a novel. Thankfully that is not the concept of this book. In the first chapter he introduces us to a pantser and plotter and tweener and their trials as writers. Getting to know these three writers is the catalyst to knowing which one the reader identifies with and on this premise the revolutionary novel writing idea is fleshed out. I am the only member of Paddle Creek Writers who has children in the home. Writing around children can be a challenge, so when this book came out several years ago, I bought it right away. I’m glad I did. Lots of great stuff in it! Can motherhood and writing go together? Absolutely! It takes some scheduling and discipline, but it can be done. 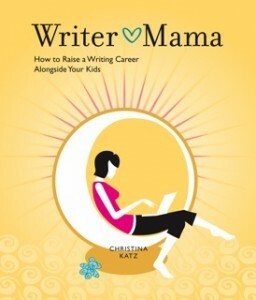 Katz outlines the steps moms can follow for a stay-at-home writing career while still spending time with their children. Short chapters and an easy to read style help make this book a pleasure to read. Writer Mama encourages new writers to start with tips and similar short pieces to gain clips to use to break into local and regional markets and then use those clips to break into glossies and national publications. There are no shortcuts and no luck according to Katz. Do your work well and pay your dues and in time editors will come to you.